In 2014, electric radiant heating sales continued to grow. For WarmlyYours, offering a diverse portfolio of radiant heating products for various areas of the home led to an increase in sales for the majority of the year. In fact, the company’s consolidated gross sales even outpaced the housing market. According to the National Association of Realtors (NAR), total home sales fell 3.1 percent in 20141. However, the housing market picked up in terms of inventory, pricing and economic growth during the second half of the year, said Lawrence Yun, chief economist for the NAR1. “The majority of remodelers are seeing growth and are confident that the market is improving, which is in line with market indicators,” said Tom O’Grady, CR, CKBR, chairman of NARI’s Strategic Planning Committee, in a statement. Nevertheless, in December, the median price of existing homes reached its highest level since 2007 at $209,500, and total housing inventory dropped 11.1 percent. Although 2014 started out a bit shaky for the housing market, WarmlyYours kicked off the year with double-digit growth. Consolidated gross sales (United States and Canadian markets combined) increased 10.2 percent in the first quarter3. The second and fourth quarters also showed strong growth with a 4.7 percent increase in sales in the second quarter and an 8.2 percent rise in the fourth quarter. The third quarter, however, declined 1.9 percent, mainly due to weak sales during the summer season in Canada. As previously stated, consolidated gross sales increased 8.2 percent in the fourth quarter3. In theUnited States, sales increased 13.6 percent3. However,Canadian sales declined during the quarter3. The fastest-growing product line during the quarter was the Other Product category, which consists of items like mirror defoggers, countertop heaters and third-party integration kits. This segment increased 705.2 percent during the fourth quarter due to the success of mirror defoggers in both the United States and Canada3. The snow-melting, deicing and slab-heating category also grew significantly during the quarter, with a 139.1 percent increase in consolidated gross sales3. This growth was mainly driven by sales of WarmlyYours roof and gutter deicing systems, which increased 1,207.5 percent during the quarter. Nevertheless, WarmlyYours snow-melting systems also performed well with a 96.4 percent increase, and slab-heating systems grew 70.9 percent during the timeframe3. 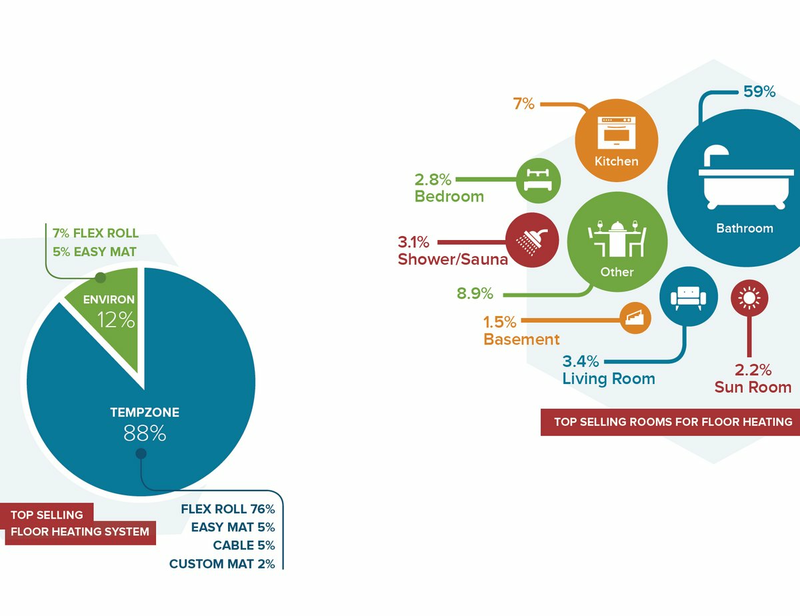 In terms of floor heating — the best-selling product category in terms of sales volume — the company’s TempZone™ Shower Mats were the fastest-growing product with a 71.1 percent increase in sales, followed closely by TempZone™ Easy Mats, which grew 66.3 percent in sales3. Environ™ Flex Rolls also performed well during the fourth quarter with a 31.6 percent increase in sales3. In looking at 2014 annual sales in the U.S. market, sales were up 7.6 percent compared with 20133. 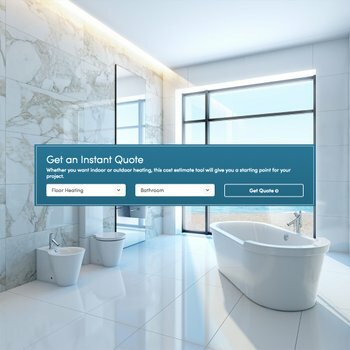 Although electric floor heating remains the volume leader of WarmlyYours’ business, its snow-melting, deicing and slab-heating products took the lead in terms of sales growth. This segment grew 100 percent last year3. The company’s Other Products category, which includes mirror defoggers as well as new countertop heaters and third-party integration kits, also demonstrated strong growth with a 69.8 percent increase in 20143. This growth was led by WarmlyYours’ mirror defoggers3. Analysis of gross sales on a state-by-state (or province) basis reveals that the Top 5 states/provinces for WarmlyYours radiant heating sales in 2014 were, in descending order, New York, Illinois, Ontario, California and Pennsylvania3. New York state jumped from the No. 4 spot in 2013 to the No. 1 spot in 2014 with a 43.1 percent increase in sales3. The floor heating category, including all products within WarmlyYours’ TempZone™ and Environ™ product lines, comprised 73.5% of all 2014 sales, leading sales of all other categories3. The TempZone™ line, which includes TempZone™ Cables, Custom Mats, Easy Mats, Flex Rolls, Shower Mats and Standard Mats for installation under tile, stone and hardwood, continues to be the strongest seller, comprising 66% of gross sales within the floor heating category3. Within the TempZone™ product line, the Shower Mats experienced the fastest growth, with a 149.2 percent increase in consolidated gross sales last year3. The Environ™ line, which includes Easy Mats and Flex Rolls for installation under carpet, laminate and floating wood, also continued to see growth. The line grew 9.9 percent in consolidated gross sales last year, with the Environ™ Flex Rolls leading this growth3. However, the breakout performer of 2014 was the snow-melting, deicing and slab-heating line, which grew 96.2 percent in consolidated gross sales last year3. This product line includes snow-melting systems, slab-heating mats and cables, roof and gutter deicing systems, and controls and accessories. With a 701.3 percent increase compared with the prior year, roof and gutter deicing systems led the product segment, followed by snow-melting systems with 85.6 percent growth3. Although WarmlyYours data indicate that radiant floor heating systems remain the most popular choice for most homeowners, it also denotes a shift in preferences from indoor heat to outdoor heat. As more and more homeowners realize that some of the unpleasantries of winter can be prevented with radiant heating solutions, demand for WarmlyYours outdoor products continues to increase. Additionally, WarmlyYours data suggests increasing demand for freestanding towel warmers that can be conveniently transported from room to room or home to home. For instance, the Barcelona towel warmer grew 161.1 percent in consolidated gross sales last year3. The Barcelona towel warmer is a plug-in, eight-bar, freestanding option. According to Scott Rosenbaum, Manager of Technical Support and Engineering, proper testing in the field is the biggest challenge for in-floor heating installers. WarmlyYours recommends purchasing a Circuit Check™ and a digital ohmmeter to ensure that your radiant floor heating system is fully functional before installing the flooring over it. The Circuit Check™ works by beeping when a short in the system is detected. 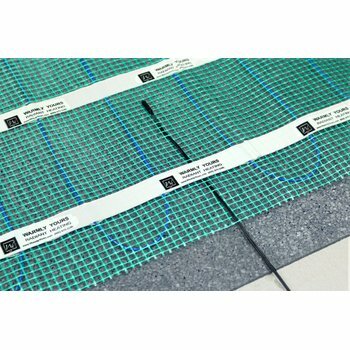 The ohmmeter measures the electrical resistance of the in-floor radiant heating system. Products should be tested three times with an ohmmeter: when the package arrives, after the product is laid out on the floor, and after the flooring is installed. These final ohms values should then be entered onto the warranty card. If customers need any installation help, the WarmlyYours technical support team is available 24/7 to provide assistance. In the first month of 2015, WarmlyYours launched a new line of Ember® radiant panels. These products offer an affordable and effective heating solution for any room in the home. The company also widened the distribution of its Studio and Metropolitan towel warmers, which were previously only available through exclusive retailers. In the first quarter of 2015, WarmlyYours plans to release the Lyric thermostat in partnership with Honeywell. This “smart” thermostat allows homeowners to control the temperature of their home from their mobile device. It also has the ability to detect when residents are home or away, allowing them to save as much energy as possible, in addition to other features. WarmlyYours plans to announce many other new products across product categories as the year progresses. Stay tuned! In 2015, WarmlyYours expects the electric radiant heating market to continue strong growth as housing sales and remodeling projects increase. According to the Leading Indicator of Remodeling Activity (LIRA), the first three quarters of 2015 will see more remodeling projects than the first three quarters of 2014 — albeit slow growth4. As a result, WarmlyYours predicts that in-floor heating sales will pick up in 2015. Industry experts also predict that creature comforts like heated floors and towel warmers will be a trend in 20155. Therefore, WarmlyYours expects to see an increase in sales of its freestanding and wall-mounted towel warmers — as well as radiant panels — this year. 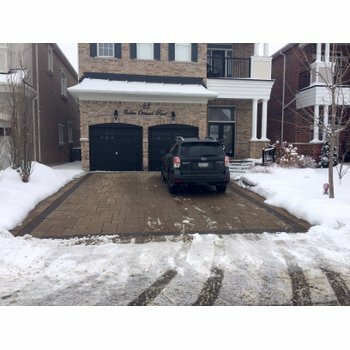 Finally, WarmlyYours expects its snow-melting, deicing and slab-heating products to continue strong growth throughout the year as more and more homeowners become aware of this technology.